Ecuadorean patriot and statesman; b. at Guayaquil, 24 December, 1821; assassinated at Quito, 6 August, 1875. 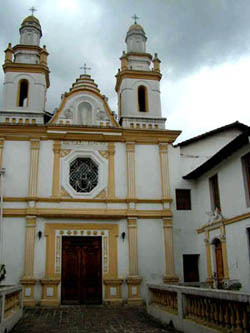 His father, Gabriel García Gomez, a native of Villaverde, in Old Castile, had been engaged in commerce at Callao before removing to Guayaquil, where he married Dona Mercedes Moreno, the mother of the future Ecuadorean martyr president. Gabriel García Gomez died while his son was still young, and the boy's education was left to the care of his mother, who appears to have been a woman of unusual ability for her task; she was, moreover, fortunate in securing as her son's tutor Fray José Betancourt, the famous Mercedarian, under whose tuition young García Moreno made rapid progress. A great part of his father's fortune having been lost, it was not without some considerable sacrifices that the youth was able to attend the university course at Quito. These material obstacles once overcome, he passed brilliantly through the schools, distancing all his contemporaries, and on 26 October, 1844, received his degree in the faculty of law (Doctor en Jurisprudencia) from the University of Quito. In less than a year after his graduation young García Moreno had begun to take an active part in Ecuadorean politics, joining in the revolutionary movement which eventually replaced the Flores administration by that of Roca (1846). He soon distinguished himself as a political satirist by contributions to "El Zurriago", but what more truly presaged the achievements of his riper life was his good and useful work as a member of the municipal council of Quito. At the same time he was studying legal practice, and on 30 March, 1848, was admitted advocate. Immediately after this the deposed Flores, supported by the Spanish government, made an attempt to regain the presidency of Ecuador; García Moreno unhesitatingly came forward in support of the Roca administration, and when that administration fell, in 1849, he entered upon his first period of exile. After some months spent in Europe he returned to his native republic in the employ of a mercantile concern, and it was then that he took the first decisive step which marked him conspicuously for the enmity of the anti-Catholics, or, as they preferred to call themselves, the Liberals. At Panama he had fallen in with a party of Jesuits who had been expelled from the Republic of New Granada and wished to find asylum in Ecuador. 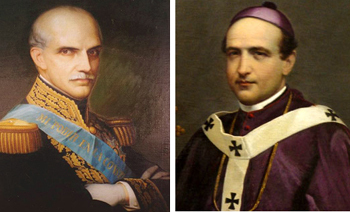 García Moreno constituted himself the protector of these religious, and they sailed with him for Guayaquil; but on the same vessel that carried the Jesuits and their champion, an envoy from New Granada also took passage for the express purpose of bringing diplomatic influence to bear with the dictator, Diego Noboa, to secure their exclusion from Ecuadorean territory. No sooner had the vessel entered the harbour of Guayaquil than García Moreno, slipping into a shore boat, succeeded in landing some time before the New Granadan envoy; the necessary permission was acquired from the Ecuadorean government, and the Jesuits obtained a foothold in that country. 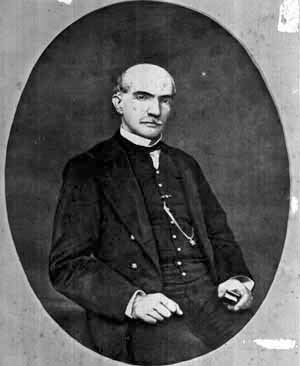 How soon the report of this exploit spread among the anti-Catholics of South America was evidenced by the fact that within a year Jacobo Sánchez, a New Granadan, had attacked García Moreno in the pamphlet "Don Felix Frias en Paris y los Jesuitas en el Ecuador", to which García Moreno's reply was an able "Defensa de los Jesuitas". In 1853 he began to publish "La Nación", a periodical which, according to its prospectus, was intended to combat the then existing tendency of the government to exploit the masses for the material benefit of those who happened to be in power. 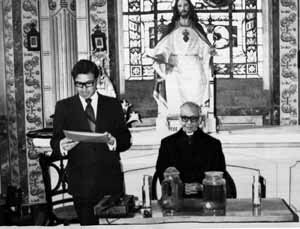 At the same time García Moreno's programme aimed distinctly and professedly to defend the religion of the people. He was already known as a friend of the Jesuits; he now assumed the role of friend of the common people, to which he adhered sincerely and consistently to the day of his death. The Urbina faction, then in power, were quick to recognize the importance of "La Nación", which was suppressed before the appearance of its third number, and its proprietor was exiled, for the second time. Having been, meanwhile, elected senator by his native province of Guayaquil, he was prevented from taking his seat, on the ground that he had returned to Quito without a passport. After a sojourn at Paita, García Moreno once more visited Europe. He was now thirty-three years of age, and his experience of political life in Ecuador had deeply convinced him of his people's need of enlightenment. It was undoubtedly with this conviction as his guide and incentive that he spent a year or more in Paris, foregoing every form of pleasure, a severe, indefatigable student not only of political science, but also of the higher mathematics, of chemistry, and of the French public school system. On his return home, under a general amnesty in 1850, he became rector of the central University of Quito; a position of which he availed himself to commence lectures of his own in physical science. Next year he was active in the senate in opposition to the Masonic party, which had gained control of the government, while at the same time he persistently and forcibly, though unsuccessfully, struggled for the passage of a law establishing a system of public education modelled on that of France. In 1858 he once more established a paper, "La Union Naciónal", which became obnoxious to the government by its fearless exposure of corruption and its opposition to the arbitrary employment of authority; and once more a political crisis ensued. García Moreno was on principle an advocate of orderly processes of government, and that his professions in this regard were sincere his subsequent career fairly demonstrated, but at this juncture he was obliged to realize that his country was in the grip of a corrupt oligarchy, bent upon the suppression of the Church to which the whole mass of his fellow countrymen were devoted, and disposed to keep the masses in ignorance so as to sway them the more easily to its own ends. He had, years before, attacked "the revolutionary industry", a phrase probably first used by him, in the prospectus of "La Nación"; it now became necessary for him to descend to revolutionary methods. Besides, the little Republic of Ecuador was at this time menaced by its more powerful neighbour on the south, Peru. García Moreno, if he was sure of opposition at the hands of the soi-disant Liberals, was also, by this time, recognized by the masses as a leader loyal to both their common Faith and their common country, and thus he was able to organize the revolution which made him head of a provisional government established at Quito. The republic was now divided, General Franco being at the head of a rival government established at Guayaquil. In vain did García Moreno offer to share his authority with his rival for the sake of national unity. As a defensive measure against the threat of Peruvian invasion, García Moreno entered into negotiations with the French envoy with a view to securing the protection of France, a political mistake of which his enemies knew how to avail themselves to the utmost. He was now obliged to assume the character of a military leader, for which he possessed at least the qualifications of personal courage and decisive quickness of resolution. While García Moreno inflicted one defeat after another upon the partisans of Franco, the latter, as representing Ecuador, had concluded with Peru the treaty of Mapasingue. The people of Ecuador rose in indignation at the concessions made in this treaty, and Franco, even his own followers being alienated, was defeated at Babahoya (7 August, 1860) and again at Salado River, where he was driven to take refuge on a Peruvian vessel. When his adversary had been forcibly driven from the country, García Moreno showed his magnanimity in the proclamation in which he sought to heal as quickly as possible the scars of this civil war: "The republic should regard itself as one family; the old demarcations of districts must be so obliterated as to render sectional ambitions impossible". In the reorganization of the Constituent Assembly, which was summoned to meet in January, 1861, he insisted that the suffrage should not be territorial, but "direct and universal, under the necessary guarantees of intelligence and morality, and the number of representatives should correspond (proportionally) to that of the electors represented". The Convention, which met on 10 January, elected García Moreno president; he delivered his inaugural address on the 2d of April following. Then began that series of reforms among which were the restitution of the rights of the Church and a radical reconstruction of the fiscal system. In the immediate present he had to deal with the machinations of his old adversary Urbina, who, from his retirement in Peru, kept up incessant intrigues with the opposition at home, and still more with the governments of neighbouring republics. García Moreno soon came to a sensible and honourable understanding with the Peruvian government. A violation of Ecuadorean territory by New Granada, though it led to a hostile collision in which García Moreno himself took part, had no serious consequences until the Arboledo administration gave place to that of General Mosquera, whose ambition it was to make New Granada the nucleus of a great "Colombian Confederation", in which Ecuador was to be included. Urbina was not above writing encouraging letters to the New Granadan or Colombian dictator who was scheming against the independence of Ecuador. An invitation to García Moreno to confer with Mosquera elicited a very plain intimation that, so far as the national obliteration of Ecuador was concerned, there was nothing to confer about. But in the meantime the Republic of Ecuador had ratified a concordat with Pope Pius IX (1862), and the discontent of the Regalista party at home with the provisions of that instrument gave Mosquera an excellent pretext for encroaching upon his neighbour's rights. The Regalistas were, without knowing it, a kind of Erastians, who claimed the appointment to ecclesiastical benefices as an inalienable right of the civil power. The President of Ecuador was charged with "casting Colombia, manacled, at the feet of Rome"; Urbina issued "manifestos" from Peru in the sense of "South America for the South Americans"; while the proclamation of President Mosquera recited, with others which seem to have been introduced merely for the sake of appearances, his three really significant grounds of complaint against García Moreno: that the latter had ratified the concordat; that he maintained a representative of the Holy See at Quito; that he had brought Jesuits into Ecuador. It may be remarked here, in passing, that if Mosquera had added to this catalogue of offences those of insisting upon free primary education for the masses, upon strict auditing of the public accounts, and a considerable bona fide outlay upon roads and other public utilities, his proclamation might have served adequately as the indictment upon which García Moreno was condemned and eventually put to death by those whom Pius IX ironically called "the valiant sectaries". Having been duly confirmed as president ad interim by the National Convention of May, 1869, García Moreno resumed his work for the enlightenment, as well as the religious well-being, of his people. It was in these last years of his life that he did so much for the teaching of physical sciences in the university by introducing there the German Fathers of the Society of Jesus. The medical schools and hospitals of the capital benefited vastly by his intelligent and zealous efforts. In September, 1870, the troops of Victor Emmanuel occupied Rome; and on 18 January, 1871, García Moreno, alone of all the rulers of the world, addressed a protest to the King of Italy on the spoliation of the Holy See. The pope marked his appreciation of this outburst of loyalty by conferring on the President of Ecuador the decoration of the First Class of the Order of Pius IX, with a Brief of commendation dated, 27 March, 1871. It was, on the other hand, notorious that certain lodges had formally decreed the death of García Moreno, who, in a letter to the pope, used about this time the following almost prophetic words: "What riches for me, Most Holy Father, to be hated and calumniated for my love for our Divine Redeemer! What happiness if your benediction should obtain for me from Heaven the grace of shedding my blood for Him, who being God, was willing to shed His blood for us upon the Cross!" The object of numberless plots against his life, García Moreno pursued his way with unruffled confidence in the future — his own and his country's. "The enemies of God and the Church can kill me", he once said, "but God does not die" (Dios no muere). One of the highlights of my (Marian Horvat)pilgrimage to Quito was to follow the footsteps of President Gabriel García Moreno, the ”truly Catholic president” Our Lady of Good Success predicted would come in the 19th century and consecrate the country to the Sacred Heart. In a fledgling Republic dominated by liberal Freemasons who had evicted the Jesuits and were ruthlessly persecuting the Church, a statesman of different ilk entered Ecuador’s political scene in the 1860s. In the 15 years of his rule, Gabriel Garcia Moreno made that small portion of land - so dearly loved by Our Lord and Our Lady - the model of a Catholic State. As head of State, his first priority was to re-establish for the Church all the rights that the Revolution had denied her, thereby raising the implacable hatred of the Radicals and Socialists. They called him autocratic because he refused concessions to the revolutionary party. They labeled him harsh because he rebuffed any deals with evil. “Liberty for everyone and for everything, save for evil and evildoers,” was his motto. One of his first acts was to issue a Concordat restoring liberty to the Church. In 1867 he established a constitutional government under the Kingship of Christ. In 1870, it was Ecuador – alone among all the nations of the world – that publicly protested the invasion of the Papal States and offered a national subsidy for the captive Pope. In 1873 he formally consecrated the Republic to the Sacred Heart of Jesus. The enraged Socialists and Freemasons who lost their offices when Garcia Moreno assumed the presidency made calumny campaigns against him. But nothing succeeded in turning the people against one so honest and good. Instead, they called him “Father of the People.” Under him Catholic schools and universities prospered, the national debt was dissolved, highways and infrastructure were built, criminals were placed behind bars or hanged, and the streets were safe. The more the people loved him, the greater the hatred of the Masons. According to biographers, there were six failed intrigues against his life after he became a major public figure in 1860. In early August of 1875, with preparations underway for the inaugural address as re-elected President on August 10, rumors were rife in Quito that a new plot to assassinate the President was underway. On August 5, a priest begged admittance to his office to warn him that an attack was being planned for the next day. He begged the President to take measures. Garcia Moreno replied, “The only measure to take after calm reflection is to prepare myself to appear before God,” and he continued his work, unperturbed. On the afternoon of August 6, Garcia Moreno was attacked by an assassin with a machete and three accomplices armed with revolvers on the porch of the Presidential Palace. Still alive he was carried to the Cathedral and died there at the feet of the altar of Our Lady of Sorrow shortly afterwards. Our pilgrimage group had the good fortune to follow the last day in the life of Garcia Moreno with Dr. Francisco Salazar Alvarado as lecturer and guide. His great uncle was General Francisco Javier Salazar, Minister of War under President Garcia Moreno and his close and trusted friend. Growing up in a family where there was constant talk of Garcia Moreno, Dr. Salazar’s interest in him grew. Later, as a diplomat, professor and journalist, he delved much more deeply into the life of his hero. He shared his findings and anecdotes with us, clearing up many discrepancies and errors in the various accounts I had read about Garcia Moreno’s death. I invite my readers to follow in the footsteps of Garcia Moreno on that last day of his life, as I recount the lecture of Dr. Salazar to our group, which I taped and now transcribe. (1) Later that evening at his home, he permitted me to scan several photos from his private collection, some of which I will reproduce for the reader here. He returned to his home to work for a while and then take a light breakfast with his wife Mariana at 9:30 a.m. He usually walked to the Presidential Palace after his meal, but that day he remained home to work on his inaugural speech he planned to deliver to Congress on August 10. The conspirators, who had planned their attack for that morning, were frustrated at this change in routine but remained resolved to attack that day. At 1:00 p.m., he left for the Palace, accompanied only by his aide-de-camp Manuel Pallares. He stopped briefly to greet his in-laws, the Alcazar family, on Sucre Street near the Jesuit Church, la Compania. Because he had been ill and the weather was cool, he buttoned up his coat and continued on his way. 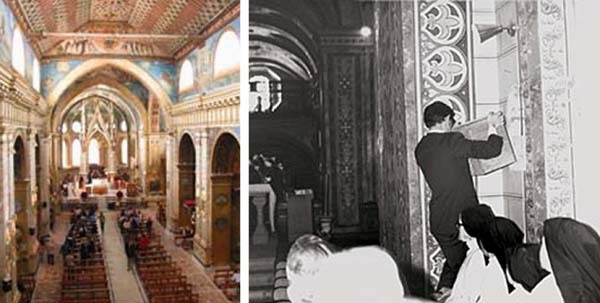 He made one more short stop, at the Cathedral, entering the chapel where the Blessed Sacrament was exposed. After this visit he left, directing himself to the Government Palace. The conspirators were ready. At the steps of the Presidential Palace he greeted several persons, including Faustino Rayo, who would shortly strike the first brutal machete blow. Rayo, who held a grudge against Moreno for dismissing him from a lucrative office because of his dishonest practices, had taken up leatherwork. He pretended, however, to be on friendly terms with the President, who had recently contracted him to make a saddle for his young son (his only living child), Gabriel García del Alcázar. He climbed the side stairs to the porch with its thick colonial pillars. At that time there were no railings between the columns, as we see today. In fact, the scrolled black grills came from the famous Tuilleries Palace in Paris, torn down by the revolutionaries and ordered by Garcia Moreno himself for Ecuador’s Palace. They would only arrive and be installed, however, after his death. He was approaching the Treasury Department’s entrance into the Palace. There, Rayo rushed forward and attacked him with a machete. The first blow struck his hat, which flew off his head and landed in the plaza below. Rayo delivered more blows, and his fellow conspirators took position and fired their guns. Their bullets only grazed him. Another shout came from Rayo and fellow assassin Roberto Andrade, “Die, Jesuit!” It was a way to say “Die, lover of Jesuits,” an Order that had been expelled by the anticlerical regime that preceded Moreno’s first presidency. 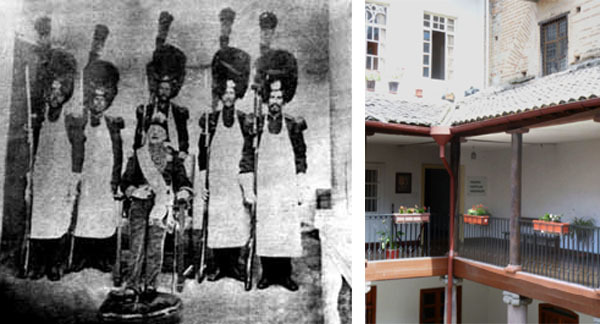 One of his early acts in 1860 had been to invite the Jesuits back and to return their buildings. Garcia Moreno tried to take out his revolver to defend himself, but his wounded hand made him fumble as he tried to unbutton his jacket. Rayo struck with the machete again, this time nearly severing the left arm. More shots sounded from the pistols of the other conspirators, Roberto Andrade, Manuel Cornejo and Abelardo Moncalyo. Again, their shots only grazed the body. After Rayo’s last vicious blow, the President staggered and fell from the porch to the ground some ten to twelve feet below, landing in front of a tavern. Today on the wall over that spot is a simple stone marker. It all happened in just a few minutes, according to witnesses. His arm broke in the fall, but Garcia Moreno was still alive. 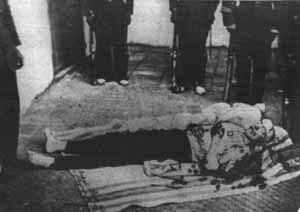 The autopsy report, made shortly after his death, (2) said that up until this time he had received no fatal wounds. One cannot help but wonder: Where was the aide-de-camp Manual Pallares? Instead of stepping forward to protect him, he had turned to run for help, leaving the President defenseless. Was he part of the plot? That was never proved, but there was little doubt in the minds of many – including the aunts of Dr. Salazar who often remarked on the incident – that he was a coward. The sound of the shots had attracted the attention of the people in the square and in the military quarters across the Plaza, where General Salazar was working that day. Women from the tavern and nearby shops had rushed to the fallen President; others were milling around the scene. Rayo and his accomplices raced down the steps to finish their shameful assignment. Pushing the women aside, Rayo struck repeated blows with his machete, including the two fatal wounds to the head, one that severed a part of his skull. More shots were fired; again the bullets only grazed the body of the President. Shouting revolutionary slogans like “Down with tyranny,” “Now we are free,” the assassins fled. Rayo tried to make his escape also, but he was behind the others. Hearing the gunshots, General Salazar had ordered troops out into the square. Now, three soldiers grabbed the fleeing Rayo and started to march him to the military headquarters. A sergeant fired a shot and killed Rayo there in the middle of the square. In his pockets were large amounts of Peruvian currency, the Judas payment of the Masons which would allow him to flee Ecuador and live in Peru. The crowds took his body, dragging it through the streets, and left it unburied for the vultures to feed upon. General Salazar arrived at the scene of the dying President and ordered Garcia Moreno to be taken to the Cathedral. His massacred body was placed at the feet of the shrine of Our Lady of Sorrow, to whom he had a great devotion. The priest who administered the Last Rites asked the dying President if he forgave his enemies. With effort Garcia Moreno opened his eyes, his expression affirming his assent. Shortly afterward, he expired. “Every morning when saying my prayers I will ask especially for humility. Every day I will hear Mass, say the Rosary and will read, besides, a chapter from the Imitation, this Rule and the instruction added to it. “I will endeavor to keep myself as much as possible in the presence of God, especially during conversations that I might not exceed in words. I will often offer my heart to God, principally before beginning any actions. “In my room, never to pray sitting when I can do so on my knees or standing. “Practice daily little acts of humility, as kissing the ground. “To rejoice when I or my actions are censured. Never to speak of myself except to avow my faults or defects. “To make efforts, by thinking of Jesus and Mary, to restrain my impatience and go against my natural inclinations. “To be kind to all, even with the importunate, and never to speak ill of my enemies. “Every morning before beginning my work, I will write down what I have to do, being very careful to distribute my time well, to give myself only to useful and necessary business, and to continue it with zeal and perseverance. 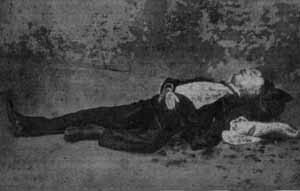 The revolutionaries had hoped that the assassination of Garcia Moreno would spark a revolution among the people, who would rally around the Masonic ideals of Liberty, Equality and Fraternity and reject the Catholic Church. Instead, the opposite happened. The people of the nation mourned their lost President, naming him the Father and Regenerator of Ecuador and regarding him as a martyr for the Catholic Faith. His wounds were stitched – amazingly, no vital organ was severed in the brutal attack – and his body was dressed in full ceremonial uniform and set up in a chair in the corner of the second floor of the Cathedral courtyard. A five-man honor guard took up position behind him, and the people traveled for miles to process past his corpse and pay him homage. At the funeral on Sunday, Garcia Moreno’s body was also set up in a chair, facing the audience, as a high tribute to the fallen President. He was buried in the Cathedral, but his body did not find a final peace there. Eight years later, with the country in revolutionary chaos, the friends and family of Garcia Moreno feared his remains could be removed and desecrated by the Liberals. In the middle of the night, they removed his corpse and placed it in a hidden place, unknown to the world until Dr. Salazar entered the history of Garcia Moreno in 1973 and began his quest to discover it. His great adventure will be related in the next article. 1. For some details, I referred to Dr. Salazar’s book, Encuentro con la historia: Garcia Moreno, líder católico de Latinoamérica [Encounter With History: Garcia Moreno, Catholic Leader of Latin America], available in Spanish in English from Our Lady of Good Success Apostolate. I also referred to the scholarly work Gabriel García Moreno and Conservative State Formation in the Andes by Peter V. N. Henderson (University of Texas Press, 2008). 2. An official report of the autopsy made at 5 p.m. that afternoon can be found in Encounter with History, Documents section, pp. 178-182, or, in the Spanish copy Encuentro con la historia, pp. 227-234. 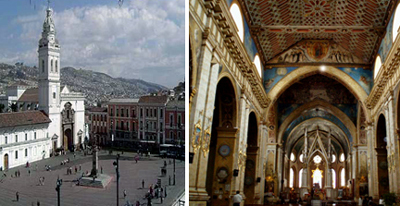 Eight years after Gabriel Garcia Moreno was murdered on that tragic August 6, 1875, renovation work began in the chapel where his coffin rested in Quito’s Cathedral. Family members feared that his enemies, still seething with resentments against the Catholic President, would take advantage of the situation to desecrate his body. On the evening of March 27, 1883, the deteriorating wood coffin containing his body and a smaller box with his embalmed heart in a crystal vial were rolled in a carpet and smuggled out of the Cathedral by friends and transferred to the house of his mother-in-law. The skeleton was placed in a new coffin, marked with the letters GGM formed with yellow nails, and transferred to a secret place. Only a few trusted friends and priests knew the location. These precautions convey the extremely hostile political climate of that time and the Liberals’ intense hatred for Garcia Moreno. Years passed, and the persons privy to the secret died. 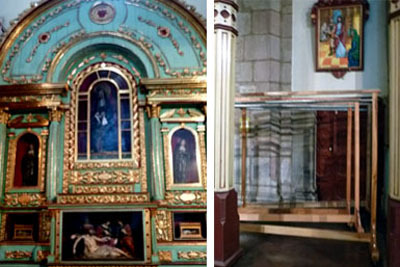 Only rumors lingered: Some said the coffin was hidden at Carmel Bajo (a Carmelite convent); others, at the Dominican Convent of St. Catherine of Siena or St. John’s Cloister; yet others, at the Church of the Good Shepherd. This remained the state of affairs until 1973, when the Ecuadorian Conservative Party started preparations to celebrate the 100th anniversary of the death of Garcia Moreno. It would be shameful to be without his mortal remains on this occasion, thought Dr. Francisco Salazar, a member of the special planning committee. He made the decision then to do everything in his power to find the corpse, hidden for 90 years. This was an Old World search, without computers or high-tech technology. The secret of the President’s hidden body was given to trustworthy persons who passed it on from one generation to another. Dr. Salazar needed to find those key persons. With an essential letter from the Cardinal authorizing his search, he entered the different convents to speak to the Superiors and make his inquiries. Two years passed, and in March of 1975, a commission was formed to offer more support to Dr. Salazar’s work. His interviews had narrowed the search to two Convents: the Good Shepherd Sisters (an Order rought to Ecuador from France by President Garcia Moreno and dedicated to rehabilitating fallen women) and the Dominican Church and Convent of Santa Catalina. At Good Shepherd Convent, Dr. Salazar spoke to a very old sister who claimed it was not the body of Garcia Moreno that had been hidden in her Convent, but rather, the embalmed hearts of the President and the murdered Archbishop Ignatius Checa y Barba (poisoned for refusing to cooperate with the Masonic government). But she refused to say anything more. She told him she could only give this information to the Mother Superior. So Mother Maria de Santa Eufrasia questioned the Sister and learned one of the Convent’s best hidden secrets: The boxes containing the hearts of the President and Archbishop were in two of the columns in the Church. Which ones? She did not know, but that precious data allowed a focused search to begin. On April 8, a day he still recalls with joy, Dr. Salazar, accompanied by the Mother Superior and sisters as witnesses, entered the Convent Church with a workman. His method was simple. Knocking on the columns with his hands, he found one in the lower choir with a hollow telltale ring about five feet up the column, signaling an interior opening. The workman opened it to reveal a cavity two feet deep and 15 inches high. Inside was a light colored wood box, and on it were these handwritten words: February 21, 1913, the Heart of Archbishop of Quito His Excellency Ignatius Checa. In the box was a flask with the embalmed heart of the poisoned Archbishop and an official document signed by Archbishop Federico González Suárez describing the contents. The heart, drained of blood, has a whitish color and is marked by a black spot, a sign of the poison that killed the Archbishop. In the pillar across from it, they found a similar niche at the same height and another wood box, this one of dark cedar. On its lid were these words: February 21, 1913, the Heart of the Illustrious Prelate Dom G. Garcia Moreno. Inside, another flask with the embalmed heart of the President and another signed letter of the Archbishop (Encuentros, Documentos, pp. 259-260). Addressed to the Superior of Good Shepherd Convent, that letter ordered that the hearts be conserved in a hidden place inside the Church. To understand this directive, issued almost 50 years after the assassination of the President, one must know something about that turbulent period in Ecuador’s history. In fact from 1895 to 1925 - the Liberal Era - the Freemasons established a laicized State with laws of civil matrimony, divorce and equal rights for all religions. At the same time the Church was persecuted: The Jesuits were expelled from the country, education was secularized, and laws were passed despoiling the properties and goods of religious communities. That persecution was particularly intense under President Eloy Alfaro, the standard-bearer of the Radical Liberal Party. With the overthrow and murder of Alfaro in 1911, Ecuador found itself in the throes of a bitter civil war. In that turbulent climate, Quito’s Archbishop judged it prudent to secure the hearts of the two conservative heroes in a secret place. Thus they were hidden in the Church of the Good Shepherd Convent in 1913. After the death of Archbishop Checa in 1877, his successors adopted the policy of keeping the Church out of all politics for the rest of that lamentable Liberal Era. Instead of encouraging the militant Catholic conservatives to rally against the Masonic government, they kept silent. The persecution of the Church continued and her action was severely restricted, but this was considered by the ecclesiastic authorities to be a “lesser evil” than facing the bloodshed and martyrdom sure to come with active resistance. This sad stance of Church authorities continues to this day, who make little to no resistance against the present-day Communist government. For some months, the crystal vials with the hearts of Garcia Moreno and Archbishop Checa had a place of distinction on the desk of Dr. Salazar in his home library. He recalls those days with fondness as an unexpected benefit of his search and an honor for his family. Finally, Church authorities decided they should be entrusted to the Oblate Fathers of the Immaculate Hearts of Jesus and Mary. The vials were placed in the Congregation’s private chapel in their residence next to the Basilica of the National Vow. Pilgrims to Quito should make a special point of ringing their doorbell to ask to venerate the two hearts. In addition, another treasure awaits them. 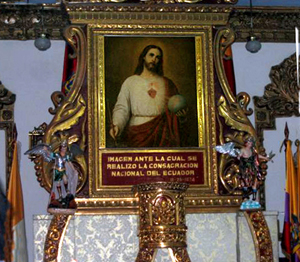 In that chapel over the altar is the original picture commissioned by President Garcia Moreno to commemorate the Consecration of Ecuador to the Sacred Heart of Jesus. The decree of the Consecration was passed by both Houses of Congress and signed by Garcia Moreno on October 18, 1873 at the Government Palace, where the picture was given a place of honor in the Congressional Hall. 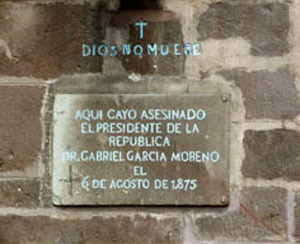 The picture was removed when the Liberal government was installed following Garcia Moreno’s death. Its animus against the Consecration was so great that at the turn of the century it went so far as to officially “de-consecrate” the country to the Sacred Heart. The picture has its own history of loss and discovery, too long to relate here. Suffice it to say that today that impressive picture of the Sacred Heart of Jesus stands custody in the Oblates chapel over the human hearts of the two murdered heroes. The crystal vial containing Garcia Moreno’s heart is in a small niche on the right side of the altar, with Archbishop Checa’s directly opposite to the left side of the altar. Three days after that surprising discovery, Dr. Salazar would have what he calls “the greatest day of my life”: The bodily remains of Don Gabriel Garcia Moreno were finally found. That is the topic of my next article.